Services - We can cater for the whole range of upholstery needs but most projects fall into one of three main categories, Re-Cover, Re-Upholster or a New Item. Below is a brief description of the three types and links to examples of each. 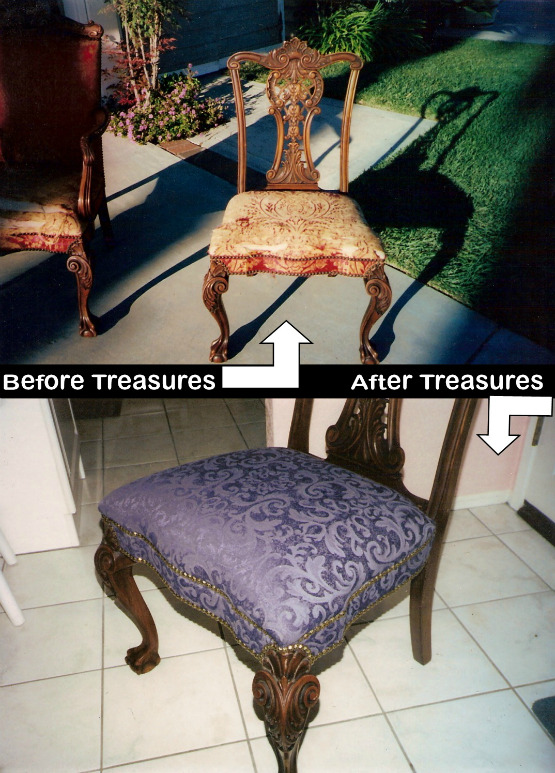 'Re-Cover' - This service is for those items that do not require the main bulk of the item being reupholstered, i.e. the item may require some refitting of the support structure but most of the work is applying a new top fabric to the item. This would include typically items such as dining chairs and more modern pieces of furniture. Re-Upholstery - For those items that are antique more traditional re-upholstery techniques will be used to maintain authenticity. It is worth noting that while the traditional form will be best for authentic pieces it is also more time consuming and therefore can be more expensive. 1000's of Fabrics including spill proof microfiber from an Interior Design School Graduate who offers for all callers a "Free In Home Consultation." Decide and get exactly what you want. Choose us, we pick it up for free, transform & restore it with free delivery.